As the ruins of the city smoldered and with distinguishing resolve, Alexander Stern, along with others, hauled lumber onto the scorched earth and began rebuilding immediately to get the businesses up and running with minimal delay. Within the succeeding year, Stern’s group managed to reestablish 246 buildings at the cost of $968,000 and encourage ongoing reconstruction throughout the devastated districts. In fact, the Magill and Co. building was the first to boast an indoor elevator after 1893. 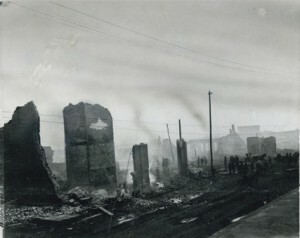 By Christmas of 1897, citizens now claimed that “Fargo is substantially built of brick and stone, most of the buildings being two stories bright and new, with paved streets make it an exceedingly handsome and clean city.” Although the fire undoubtedly cost the city and its citizens millions in financial and emotional devastation, it caused a revision of architectural approaches for a renewed business district that not only helped Fargo overcome the initial and immense losses, but also created a stronger and more capable structure for a lasting city refusing to fade into obscurity.